Here at EFTCO, we understand that the world is changing to a more and more digital world. Not just the young new businesses, but in every sector, on every location in the world, companies are changing their way of work to adapt to this ongoing digital era. Therefor we are proud to announce we have created a digital platform for different types of users, based on the Tank Cleaning sector. Those users can use our webapplication for their specific role within the EFTCO Food Assessment process. Every type of user can perform different actions or use different functionalities. All of which in a dynamic online environment. Interested in having your own account? Request your own specific account type by email at secretary@eftco.org. 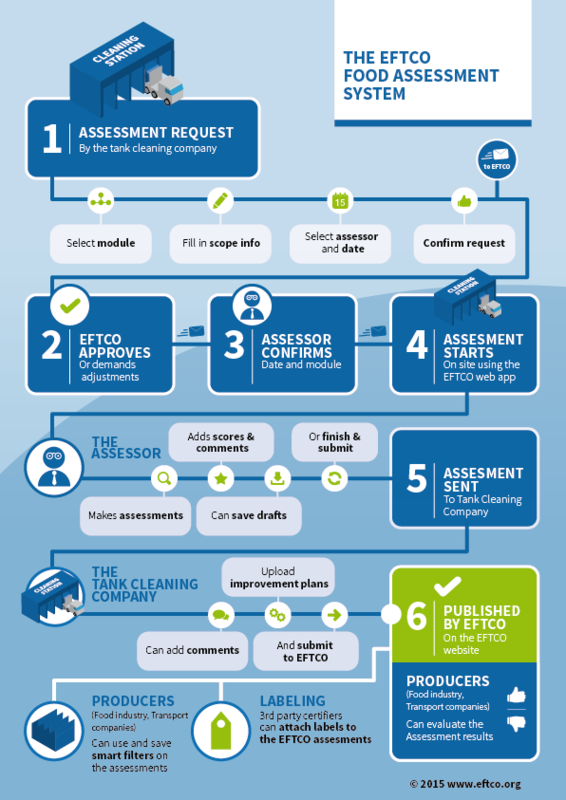 The image to the right explains the flow of the webapplication and how different users can interact throughout the process of the EFTCO Food Assessment. Please find a list of all the new modules the new website and webapplication have to offer, below. Optimized for use on a wide array of resolutions. Part 1 & 2 questions are valid for chemical and food tank cleaning. Some of these questions can be marked as “not applicable” for cleaning stations cleaning foodstuff only. The SQAS questionnaires & reports can be downloaded and/or consulted on the website www.sqas.org and are published on the EFTCO website in pdf format.